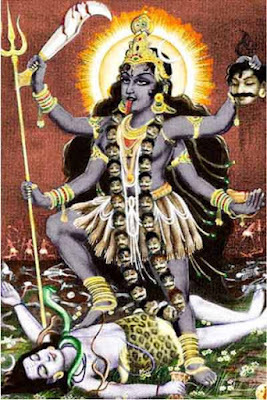 Dakshina Kali means south facing Kali or in the spiritual sense the direction pointing towards knowledge, that provides immortality. Sadhana of Dakshin Kali helps in achieving knowledge and wisdom. This Dakshina Kali mantra is also known as the beej mantra. This is a powerful Eka Akshar Mantra and it should be chanted with complete purity – both physical and mental. It is beneficial to students. They will develop intelligence to understand and solve lessons easily. Good for job seekers who have been failing in job-related exams and interviews. The mantra is good for scientists and researchers. It is the ideal mantra for spiritual aspirants to keep kind in control. The mantra helps in overcoming the fear of death. The mantra should be chanted after taking bath in the morning or during Pradosh period (starting 1.5 hours before sunset). Take bath and then offer prayers to Ganesha. The mind should be filled with thoughts of Goddess. Keep an image of Goddess in the South side of the house. Light lamp with a single wick. Sit in meditation posture and chant the mantra 108 times. Keep the count on a Rudraksha mala.